Garden pictures are a perfect way to see everything you love about gardening. For many, learning is best done visually. Slideshows lend themselves perfectly to this. Garden slideshows can cover anything and everything. If you need training for how to grow a vegetable garden, there's a slideshow for it. Want to learn to identify trees? There's a slideshow for that, too. Wondering what garden snakes eat? Yes, there's a slideshow for that as well. Are you trying to figure out what's eating your plants? You guessed it. There is a slideshow on garden pests, too. Garden slideshows help you to understand in ways that a regular article can't. Not only can you read about a garden topic, you can see key points as well. This helps your mind to grasp concepts even better. Whether you want to learn how to grow vegetables in containers, or you're interested in reviewing beautiful sugar maple tree pictures, you've come to the right place! The best part about garden slideshows is that they allow you to dream. Much like a seed catalog in the winter allows every gardener fantasize about the coming spring, garden slideshows let you see beautiful garden images any time you want to see them. 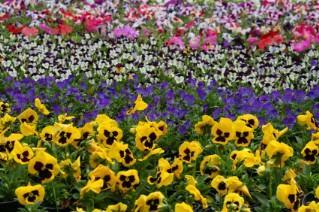 You can see a collection of lovely spring flowers or you can see Bellingrath Gardens in Alabama. Then, when you're ready to create your own perfect garden, you can learn about types of soil. You can even create a garden within your home with the help of garden slideshows. So get started. Take your pick; there are plenty to choose from. Keep checking back, too. You'll find that the list, like any wonderful garden, keeps growing and growing.